Early this spring I managed to get away for a family vacation to Florida. Excited about escaping the cold at the time, we ended up driving down. 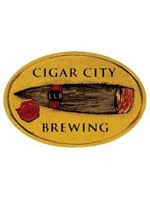 When we arrived the plan was to stay in Orlando, but being that it is so close to Tampa, I decided that I should take a trip to the renowned Cigar City Brewing brewery. the drive was pretty short. Located in a more industrial part of the city, the brewery itself is quite small for such a huge reputation. This Tampa craft brewery has many beers considered to be some of the best in the world, and a quaint tasting room right off of the brew house as an added plus. Bustling with activity, the brewery is currently working at full capacity and it is easy to understand why. Prior to the tour, you are able to enjoy some beer in the tasting room. We opted for their small batch Imperial Sweet Stout (review to follow). Wow was this a treat. An amazing first impression was made. then walked to there cold storage where they had some small batch specialty beer aging in oak bourbon barrels. These limited releases fill about 300 x 750mL bottles. They generally charge $30 each, and within hours you can see them listed on eBay for as much as $300. Unfortunately you have to be at the brewery for the release to get one. Walking back we passed the filter and bright tanks. With the change from bottle conditioning to forced carbonation, these bright tanks have allowed Cigar City Brewing to get their product to the market faster. Then kegging and a 6 head bottler. This is hand crafted beer at its best! After some questions, we were led back to the tasting room for some sampling as well as retail purchases. We managed to try just about everything that they had on tap and were delighted with most. From their Jai Alai IPA, Maduro Brown Ale to the Imperial Sweet Stout, how could one be disappointed. I managed to pick up a few bottles of one of their stouts that I promise to review later. Currently they are in my cellar getting some age on them. I look forward to returning in the future to see how a planned expansion treats them. Hopefully some of their beers will make it a bit further north. Seems like it would be worth the trip. I have heard lots about their beer and want to try it.